Principal Investigators (PIs) and a safety officer/mountaineer worked together on the megadunes expedition. Each member brings unique expertise and knowledge to the team. While they worked together to set up and operate the various testing apparatus and experiments, they also concentrated on their own specialties. 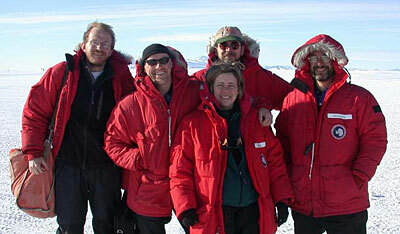 Megadunes Research Team 2002 (left to right): Mark Fahenstock, Rob Bauer, Mary Albert (in front), Christopher Shuman, Ted Scambos. Mary Albert received a BS degree in mathematics from Penn State, MS degree in engineering sciences from Dartmouth, and a PhD in applied mechanics (computational fluid dynamics) from University of California San Diego. Mary is a scientist in the Geophysical Sciences Division at the Cold Regions Research and Engineering Lab (CRREL). She is also adjunct professor at Dartmouth College, where she mentors students at both the graduate and undergraduate levels. Mary's current research focuses on experimental and numerical aspects of snow physics and transport processes in porous media. She has spent many field seasons in Greenland and Antarctica investigating the physical properties of snow (microstructure and permeability) and their effects on air-snow transport processes. She has developed a multidimensional model for heat, mass, and chemical species transport through snow and firn, and is validating the model with field data. Ice core analysis will build on the model developed by Mary Albert. This model simulates air flow and diffusion, including transport of heat, vapor, chemical species, and sublimation (when snow goes from solid to vapor without first melting). Mary's megadunes research focuses on firn permeability measurements, quantitative microscopy of microstructure, and modeling air flow and vapor transport. Biographical information courtesy of CRREL. Rob Bauer began working at NSIDC while studying geography and remote sensing at the University of Colorado. He is now the Antarctic Glaciological Data Coordinator for the National Science Foundation's Office of Polar Programs at NSIDC. He is an experienced rock and ice climber, skier, pilot, and backcountry traveler. 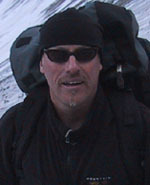 Rob has also worked as a climbing instructor and guide for river and alpine trips. 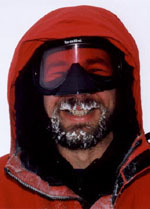 Rob's unique combination of scientific research, mountaineering, and mountain rescue experience made him an effective safety officer on the megadunes expedition. To prepare for this work, Rob took intensive backcountry medical training in Durango, Colorado. "It was the most amazing training I've been through," he says of this course, comparing it to advanced first aid and other medical training he has had. This training prepared him to deal with trauma and emergency medical situations in the backcountry. As a member of the team, Rob says of his duties: "Number one: keep everybody alive." He is also responsible for building sleds to transport radar equipment, and will help with all aspects of setting up the equipment and conducting research in the field. Mac Cathles graduated with his BA degree in Physics from Colby College in 2003. 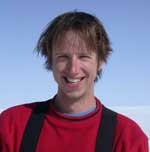 During his undergraduate years, he worked summers at CRREL with Mary Albert, including summer 2002 and 2003 field work at Summit, Greenland. 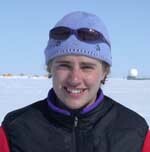 Before going to graduate school, Mac took time during 2003-04 off to participate in polar science. Mac worked as a science technician at Summit during the first winter-over rotation (Aug-Nov '03), and spent December-January doing measurements for Mary Albert and Chris Shuman at the megadunes. Zoe Courville is currently a PhD student at the Thayer School of Engineering at Dartmouth College, working with Dr. Mary Albert from CRREL. Zoe has an MS degree from the Thayer School and a BS degree in mechanical engineering from the University of Denver. Zoe spent the summer of 2003 at the Summit Camp in Greenland working with Mary studying diffusion, permeability, and microstructure of polar firn. She worked on similar measurements at the megadunes site in 2003-04. Mark Fahnestock from the University of New Hampshire, received a BS degree in Geology from the University of Rochester in 1984 and a doctorate in Geology from the California Institute of Technology in 1991. Since then he has worked as a glaciologist investigating ice flow mechanics and surface conditions on the large ice sheets. His research covers many aspects of land-based ice. He has worked in Greenland and Antarctica on a variety of projects and participated in several Antarctic and Greenland field excursions. His recent interests focus on the controls underlying rapid ice flow and on atmospheric interactions that determine surface conditions on the large ice sheets. The primary tools for this work are satellite-derived and surface observations and interactions with ice sheet modelers. On the megadunes project, Mark works with Dr. Chris Shuman, focusing on remote sensing to determine the thermal emission and surface temperature of the dune areas. Specific areas of responsibility are: passive-microwave time series (including AMSR) and thermal-IR remote sensing, field thermal profiles and logging system, and boundary-layer modeling. Biographical information courtesy of the University of New Hampshire Institute for the Study of Earth, Oceans, and Space. 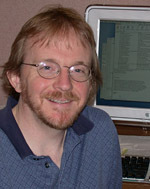 Terry Haran attended the University of California at Davis majoring in geology, and received his BS degree in Mathematics from the College of Notre Dame in Belmont, California. He has worked as a scientific programmer on a variety of projects ranging from image processing to orbital mechanics. He joined NSIDC in 1997 and has been working with Ted Scambos on glaciological applications of remote sensing. 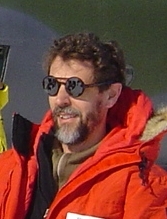 Terry accompanied Ted during a cruise aboard the Aurora Australis with the Australian Antarctic Division in the fall of 2003, acquiring satellite and field measurements of sea ice surface temperature and albedo off the Antarctic coast near Casey Station. After a single month back home in Colorado with their families, Terry and Ted returned to Antarctica for the Megadunes 2003-04 field season. Terry led the effort to deploy two new automatic weather stations (AWS), one upwind and one downwind of the field camp, that transmit data via satellite back to Mark Fahnestock in New Hampshire. He also refurbished and retrieved 11 months of data from a third AWS close to camp that had been installed the previous year by Mark. Ted Scambos received his master's degree from Virginia Tech and his PhD in Geology from the University of Colorado at Boulder. His interest in satellite data began when he used Landsat imagery for his PhD thesis. He worked with NASA at the Goddard Space Flight Center, studying Antarctica using satellite data. Now Lead Scientist at NSIDC, Ted has conducted field studies of the West Antarctic ice sheet and remote sensing of West Antarctic ice shelves with colleagues Christina Hulbe of Portland State University and Dr. Mark Fahnestock of the University of Maryland. Ted has extensive field experience in Antarctica; these trips were his sixth and seventh. Besides field work, his research concentrates on visible and near-IR remote sensing (MODIS, Landsat 7, IKONOS), field GPS, and GPR. "We should have data available to the public sometime in 2005," he said. "And then the cryospheric science community can further analyze the data. It may take years to figure out what other research still needs to be done in the megadunes." For the megadunes project, Ted concentrates on visible and near-IR remote sensing (MODIS, Landsat 7, IKONOS), field GPS, GPR, stake lines, and beta cores. Christopher Shuman received his undergraduate degree from Moravian College, Bethlehem, PA, and his master's and doctorate degrees from Pennsylvania State University. Christopher is a member of NASA Goddard Space Flight Center's Laboratory for Hydrospheric Processes (Oceans and Ice Branch). He is also an Adjunct Research Faculty member of the Earth System Science Interdisciplinary Center at the University of Maryland. Christopher has played an important role in bridging the gap between field measurements of snow and firn and satellite image data. He has published extensively on using satellite data to interpolate surface temperature and accumulation across the vast expanses between automatic weather stations (AWS) and other field sites. Christopher's research on the megadunes includes AWS and snow pits/sampling, grain-scale, and layer measurements. He was on the megadunes team during the first field season. Biographical information courtesy of NASA's Earth Observing System (EOS) and the NASA Goddard Space Flight Center. Others working at the megadunes site during the second field season included Jeff Severinghaus from the University of California, San Diego, Makoto Suwa from the Department of Geosciences at Princeton University, and Louise Albershardt from Ice Coring and Drilling Services (ICDS) at the University of Wisconsin, Madison. This group was known as the "ice core team," drilling several shallow cores and one deeper core to about 120 meters.